People are rightly attracted to install a stove because it makes such a visible difference to a room. But remember, burning fuel creates deposits. These can settle on the glass front and obscure the view. You can mitigate the effect by choosing kiln dried logs with low moisture content, but Evolution’s new Actiview system goes further. It enables the stove itself to keep its own glass clean for longer. Like all fires, a stove needs an airflow to ignite the fuel and keep it burning. The difference with an Evolution Stove is that a system of hidden ducts and channels directs three types of airflow into the fire. Smokeless fuels require an airflow beneath the coals which comes in via the primary air intake. As well as keeping non-wood fires burning brightly, the primary flow is also used to get a log fire started. 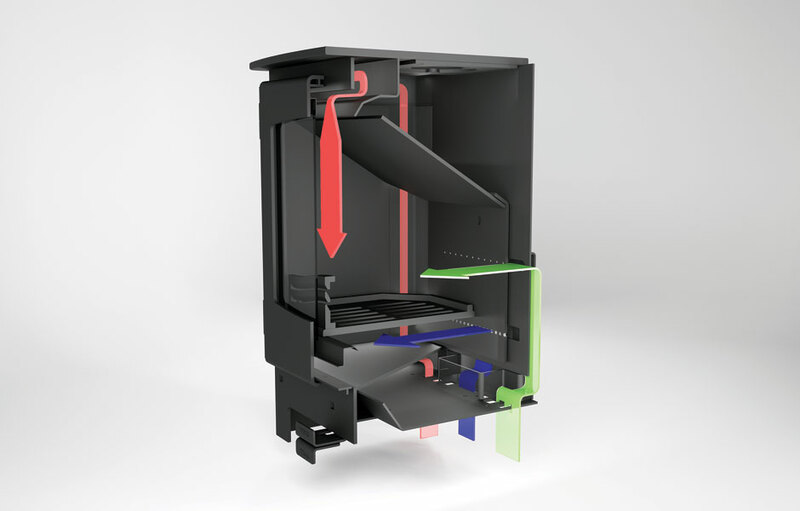 A secondary intake introduces an airflow into channels around the back and top of the stove where it warms up and circulates down the surface of glass – the Actiview system. This current of pre-heated air prevents smoke from coming into contact with the glass, maintaining a clear view of the fire. As the air continues to circulate across the burning wood, it combusts unburned volatile gasses for a cleaner burn. The latest Evolution models have a series of air holes punched into the back of the fire box. This allows small jets of air to pass through and ignite, sending spurts of flame into the heart of the fire to boost combustion. You can regulate the rate of burn by using the simple slide controls. One opens and closes the primary air intake, the other regulates the secondary air intake.